PH lamps are designed by Poul Henningsen, hence the name PH lamps. A wide range of PH lamps are to be found, but among the most widespread and widely sold are The Artichoke, Contrast, PH 5, PH 3/2 and the Bombardment Chandelier. Below you can read about several of these PH lamps and Poul Henningsen’s history. Poul Henningsen’s Contrast is one of the PH lamps with the most lighting properties contained in one and the same lamp via its 10-shade design. Each shade consists of four different surfaces in red, blue, white and chrome for perfect reproduction of the light. Inside is an adjustable pendant rod, so the form of the light and its direction can be regulated. The lamp was one of the PH lamps that due to its complicated composition was especially expensive to produce and for this reason the lamp went out of production in 1991. The Contrast lamp is closely related to the lamp known as the PH Snowball, still in production today. Again, the lamp is designed on the principle of a reflective multi-shade system, where the light source is placed in the centre of the spiral to give off a comfortable and well graduated light, without glare. Poul Henningsen worked throughout his life to optimize light, improve his PH lamps and develop his ground-breaking design further. Also combinations of shades, their number and position in relation to each other, shade material, etc captivated him. As well as the traditional PH lamps countless chandeliers were also produced, today known as the Bombardment Chandelier, Stem Fitting, Academy Chandelier, Emperor Chandelier and Rise and Fall Chandelier. The Bombardment Chandelier in particular has been produced in a wide variety of versions. It can be found with everything from three, five, six, seven and nine branches, up to 12 and 15. The chandelier comes with one tier, or two or three tiers, and materials used range from earlier copper and brass versions with opal glass or amber glass shades, etc to later chromed metal versions with glass shades. 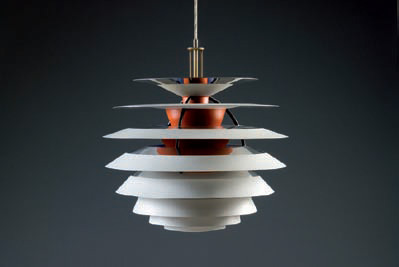 In connection with the 25th anniversary of Louis Poulsen, the Bombardment Chandelier was put into production again for a limited period.